This condition is very common in dogs and particularly with German Shepards, Bull Terriers and Staffies. This, I classify as a skin ailment and should be addressed accordingly. However, specifically, the continuous licking of feet and paws is a clear sign that your dog lacks probiotics. You would be well advised to administer natural probiotics or spirulina. Even better, and certainly a must for the three breeds mention above, is to include Raw Dirty Tripe in their meal. German Shepards, Bull Terriers and Staffies metabolize the enzymes found in tripe better than other probiotics. It is essential for their diet. In these breeds I would recommend including 250grams twice to three times per week. In other breeds, once a week would be adequate. This can be supplemented in conjunction with other probiotics. Raw tripe is available from your butcher or local supermarkets. 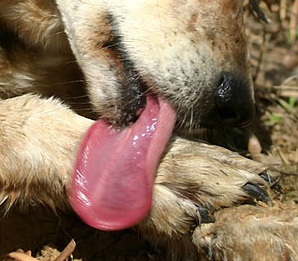 Externally and to discourage the habit of licking the paws, one could rub aloe bitter gel onto their feet. This is a sure sign that your companion is lacking something nutritionally. It is not uncommon for your dog to eat its own stool, the wood from your skirting board, toilet paper or other disgusting objects. Also very common, but pleases me greatly, is when your dog eats your garden, the herbs within, the flowers, roots and grass. He is merely fulfilling the nutritional void from his daily feed and finding relief in other nutritional ingredients. In the wild, dogs and cats would graze a variety of mineral enriched grass, flowers and herbs, instinctively identifying the healing and cleansing agents that they contain. The medicinal and mineral wealth in herbs is well documented and is essential to the health of all animals. It still amazes me that after thousands of years of being domesticated, our canine friend is still able to instinctively know what his body requires to make him nutritionally complete and to treat sickness and ailments. Therefore, if your companion is exhibiting strange eating habits, then I would certainly include a variety of natural and wholesome ingredients into his meal. You will be surprised what fantastic results you will gain from just adding vegetables into your companion’s diet. Most people have fresh herbs at home or can easily acquire some. Having a variety of herbs at home is the equivalent of having a walk-in pharmacy on your door step. Depending on the mood of your companion, health and ailment he will automatically know which herbs to choose. This is quite amazing. I would also supplement diet with supplements that we know to support digestion: pro-biotics, spirulina, diatomaceous earth, apple cider vinegar, a natural and vitamin supplement. 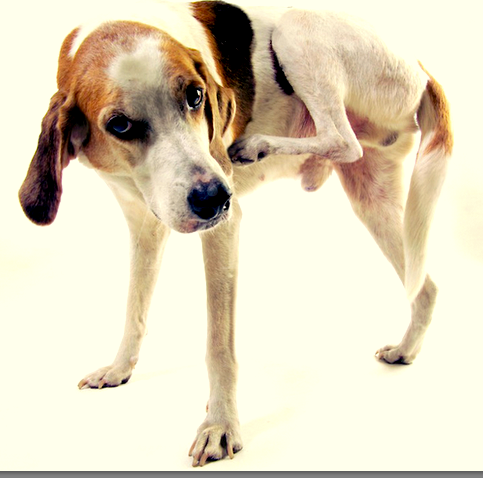 Almost every dog is struggling with itchy skin and allergies. Whether I am lecturing in Cape Town or Guateng, every pet owner complains about itchy skin. I don’t believe that even the veterinarian industry knows how grave this problem actually is, because people would certainly be reluctant to report such an “insignificant” matter to their vets and at a great expense. I personally deal with about 20 emails each day relating to skin disorders alone. What ever advice you may heed, you certainly do need to make a change in your habits. If not, this problem will not go away. Skin disorders are a sure sign that something is going wrong. I see it as your pet’s saving grace. Your change in attitude and habits may actually steer your companion towards a healthier life and improve longevity. I have written much on skin disorders for Furkidz and offered some valuable advice. Some of the relevant editorial that I presented previously was “flea, ticks and skin allergies – natural remedies”. I also offered “a solutions to solving your pets itchy skin and allergies – internally and externally”. My article on “Rooibos Tea” and “Apple Cider vinegar” also showed how useful these supplements could be I treating skin disorders. The success we have had in treating skin related ailments is advising our clients to stay away from feeding sugars, dairy or any preserved food. This includes dry kibble as they are all preserved. Rather experiment with natural diets that are wholesome and full of vegetables. Refrain from using hard chemicals and poisons when grooming or dealing with fleas and ticks. There are many natural remedies available. Skin disorders and allergies can be cured. All that is required is a holistic and natural approach. Some people prefer feeding once a day and others twice. Obviously, for young puppies they certainly should be feeding a few times a day. But for the rest, it’s really your own preference. I personally have only ever fed my companions once a day, at night, and to be honest I can’t really remember why I chose this routine. There are those who feel that their dogs are derivatives of wolves or jackals and if this is the case then these predators or scavengers would have only eaten a meal from time to time. Therefore, feeding once a day would be more appropriate. 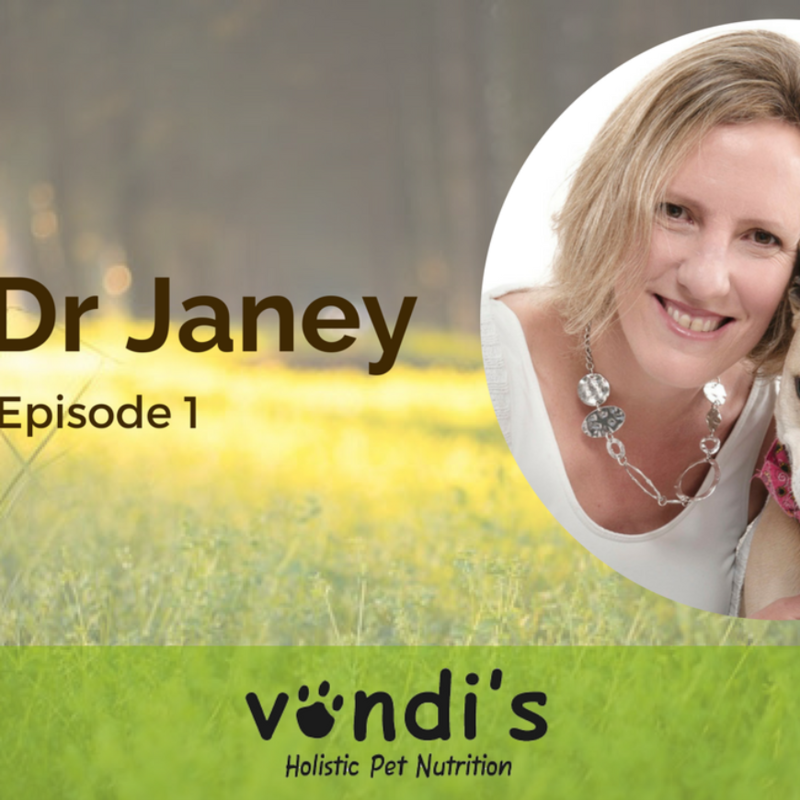 Interestingly, when I was lecturing in Darling some time ago, the local vet advised that people feed their pets twice a day. This is because that area is known to infested with ticks and the dangers of biliary were rife. Should your pet be infected, then you could already pick up the danger signs when he missed his first meal. You would then be more observant and monitor his eating habits thereafter and take the necessary medical action. Generally, in summer the eating habits of our pets change as they do for humans. When the weather is very hot we loose appetite. Perhaps during the hotter months one could feed once a day. Conversely, during winter our companions need to build body fat and would benefit from two meals a day.